You can blame Strong Bad for Telltale's The Walking Dead, according to Robert Kirkman. In the wake of last week's conclusion to Telltale Games' zombie epic - and no, there shall be no spoilers here - Robert Kirkman, creator of The Walking Dead graphic series, decided to spill the occasional bean about his collaboration with the game maker. According to Kirkman, we can blame Strong Bad for Telltale's adaptation. "I played [Telltale's] Strong Bad game," Kirkman said. "I like their approach to puzzle-based storytelling. I thought they were more focused on telling a good story, and I thought they were good at engaging the player in the narrative." 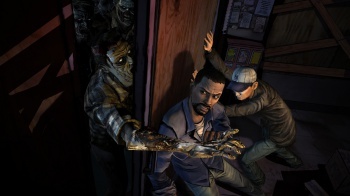 It was Telltale's revelation that the game would focus on the players making choices between two bad decisions that sold Kirkman on Telltale. Kirkman hasn't been as hands-on with the game maker as he has with the television show. "I've been kind of the godfather," Kirkman claims, adding that, as he isn't a game maker and doesn't understand that world, he didn't want to meddle too much in what was clearly Telltale's area of expertise. "I'm impressed with the brilliant storytelling and with how good this game has turned out," Kirkman said, "which is really a testament to how talented their writers are." Writers who gave us Episode 5, and that final scene; or the moment with Kenny and Katjaa in Long Road Ahead; or ... but you get the idea. Here's hoping Season Two isn't that far away!